As the Allied offensive ground on west of the Rhine River, dozens of Ger­man tank and in­fan­try divi­sions gathered in assem­bly areas north­west of the city of Cologne and in the thick forest cover of the Eifel Moun­tains on this date in 1944. Con­ceived by Adolf Hitler, the plan, code­named Wacht am Rhein (Opera­tion Watch on the Rhine), was to attack through the weakly held Amer­i­can lines in the Ar­dennes Forest in Luxem­bourg, recapture the deep-water Bel­gian port of Ant­werp, sever Allied supply lines, split Field Marshal Ber­nard Mont­go­mery’s army in Northern Bel­gium and Hol­land from Gen. Omar Brad­ley’s armies to the south, and force the West­ern Allies, sep­a­rate from the Soviet Union, to nego­ti­ate a peace treaty in Ger­many’s favor. Once that was accom­plished, Ger­many could buy time to design and pro­duce more advanced wea­pons (for exam­ple, the Messer­schmitt Me 262 jet air­craft and the Panzer­kampf­wagen E‑100 super-heavy tank) and fully con­cen­trate on defeating the Soviets on the Eastern Front. Warning signs of a pending Ger­man offen­sive had been ignored when, on Decem­ber 16, 1944, in a care­fully coor­di­nated attack, more than 300,000 Ger­mans launched what became known as the Battle of the Bulge, or the Ar­dennes Offen­sive. Fierce resis­tance on the north­ern shoulder of the offen­sive around Elsen­born Ridge and in the south around Bas­togne (see map below) blocked Ger­man access to key roads to the north­west and west that they counted on for suc­cess. The acting com­mander of the trapped 101st Air­borne Divi­sion, Brig. Gen. Anthony McAuliffe, famously replied “Nuts” to the Ger­man demand of Decem­ber 22 to sur­render the cross­roads town of Bas­togne. The day after Christ­mas Bas­togne was relieved when ele­ments of Gen. George S. Patton’s U.S. Third Army burst through Ger­man lines. Even­tually more than a mil­lion GIs were thrown into the battle, and by mid-Jan­u­ary 1945 Hitler’s gam­bit had col­lapsed. Ger­man losses ranged from 60,000 to 100,000 men (half of them pri­soners) and more than 600 tanks and heavy assault guns. Offi­cial Allied casual­ties ranged from 90,000 to over 100,000. The Battle of the Bulge (Decem­ber 16, 1944, to Janu­ary 25, 1945) was the greatest single extended land battle as well as the blood­iest that U.S. forces expe­ri­enced in World War II—19,000 dead and nearly 50,000 wounded. Its net effect, how­ever, was to delay the Allied conquest of Germany by just six weeks. Above: The German Army launched a surprise attack in Bel­gium and Luxem­bourg in December 1944 in an attempt to reach the Bel­gian port of Ant­werp and the North Sea and thus drive a wedge between the British and Amer­i­can forces in North­ern France. The army drew on every avail­able resource it had left—300,000 men, 970 tanks and assault guns, and 1,900 artil­lery pieces. This map shows the extent of the Ger­man counter­offen­sive that created the so-called “bulge” in Allied lines between Decem­ber 16 and 26, 1944. The original Ger­man objec­tives are out­lined in red dashed lines. 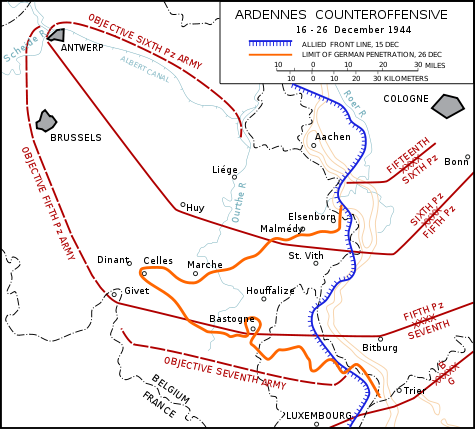 The orange line indicates the Ger­mans’ furthest advance west­ward. The Ger­man advance was stopped at the Meuse River at Dinant, shown just west of the orange bulge. 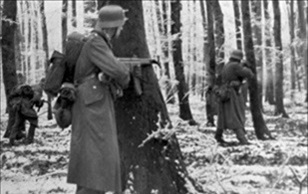 Left: A German regiment in the bitterly cold Ar­dennes Forest, Decem­ber 1944. Hitler selected the Ar­dennes for his west­ern counter­offen­sive for seve­ral rea­sons: the ter­rain to the east of the Ar­dennes and north­west of Cologne was heavily wooded and offered cover against Allied air obser­va­tion and attack during the build-up of Ger­man troops and sup­plies; the rugged Ardennes wedge itself required rela­tively few Ger­man divisions; and a speedy attack to regain the ini­ti­a­tive in this par­tic­u­lar area would erase the Western Allies’ ground threat to Ger­many’s indus­trialized Ruhr centered around Duessel­dorf and delay their advance on Berlin. 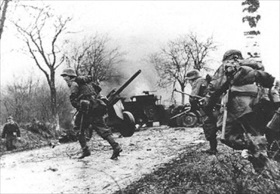 Right: German troops advance past abandoned Amer­i­can equip­ment. The West­ern Allies’ string of daz­zling suc­ces­ses in 1944, news reports of the bloody defeats that the Soviet armies were admin­is­tering to the Ger­mans on the East­ern Front, and the belief that the Wehr­macht was coll­apsing and the Third Reich was tot­tering on its knees led Allied war plan­ners to pay scant atten­tion to the quiet Ar­dennes sec­tor. The Amer­i­cans espe­cially paid dearly for this mind­set, as well as for ignoring their own intel­li­gence of the Ardennes counteroffensive preparations. 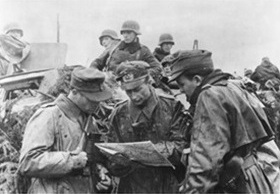 Left: German field commanders plan their advance through Luxem­bourg’s Ar­dennes Forest. In the Battle of Elsen­born Ridge, which lasted 10 days, the Amer­i­can and Ger­man lines were often con­fused. The main drive against Elsen­born Ridge was launched in the forests east of the twin vil­lages of Roche­rath-Krinkelt on the early morning of Decem­ber 17, 1944. This attack was begun by tank and Panzer­grena­diers (mecha­nized infan­try) of the 12th SS Pan­zer Divi­sion Hitler­jugend. By Decem­ber 27, the Ger­mans had beaten them­selves into a state of use­less­ness against the heavily fortified American position. 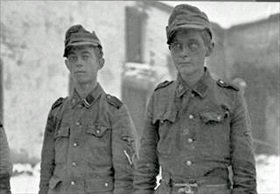 Right: Captured teenage youth from the 12th SS Pan­zer Divi­sion Hitler­jugend. Units of Gen. Leonard T. Gerow’s V Corps of the U.S. First Army held Elsen­born Ridge against the elite SS division, pre­venting it and attached forces from reaching the vast array of sup­plies near the cities of Liège and Spa in Bel­gium, as well as the road net­work west of the ridge leading to the Meuse River and Ant­werp. This was the only sec­tor of the Amer­i­can front line during the Battle of the Bulge where the Germans failed to advance.